A little while ago, I mentioned the St. Berndardus variety pack that I got my hands on, but until now, I hadn't actually cracked it open. I'm not an expert of beer and food pairings, but I was having some Sushi the other night and I had recently run across this Beer Sommelier, which matches meals with beer styles. When I looked up Sushi (just FYI, it's under seafood, not fish), it recommended various kinds of wheat beers and in consulting my cellar (i.e. my fridge), I saw that the St. Bernardus variety pack indeed included a Belgian style witbier. 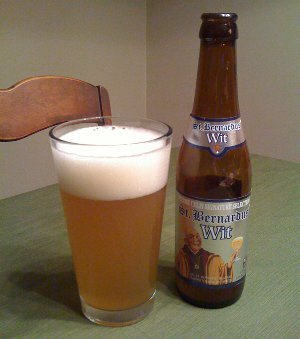 I would not call myself a huge fan of wheat beers, but I've had a few good ones in my time, and I was hoping for a lot from St. Bernardus. Not an overwhelming start to the variety pack, but it's an enjoyable brew and I can guarantee that some of the others in the pack will wow me. This page contains a single entry by Mark published on January 17, 2011 11:25 PM. Double Feature: Animated Stouts was the previous entry in this blog. General Washington's Tavern Porter: A Screenplay is the next entry in this blog.